Alasdair Heron was born on 24:07.42 and really hit the attention of Scottish athletics in 1962 when he won the junior national cross-country championship in the colours of Edinburgh Southern Harriers. He won two international vests for Scotland and ran superbly well in the SCCU championships. He was also a top class track runner excelling at all distances from the mile up to six miles as well as the steeplechase. His time at the top however was limited to the years between 1962 and 1965 inclusive although he did run a little in 1966. Heron’s first big victory came in the National Junior Championship of 1962 when he won from an outstandingly good field – look at the first eight finishers. 1st. AIC Heron, 2nd. JC Douglas: 3rd. M Ryan; 4th. A Faulds: 5. J Bogan; 6. J Finn; 7. R Donald; 8. JL Stewart. This run of course had him an automatic selection for the international cross-country championship at Graves Park in Sheffield. The senior men’s team disappointed but the Junior squad of Lachie Stewart, Alasdair Heron and Jim Finn were placed 10th, 11th and 16th to win the bronze medals. Heron was a student at Sidney Sussex College in Cambridge in 1962 with best times of 9:21 for Two Miles and 14:20 for Three Miles both of which ranked him in the top ten in the Scottish rankings. Almost all of his running seems to have been done in the South of England and in 1963 he had best times which ranked him in three distances – 4:15.7 for the Mile (11th), 9:20.3 for the Two Miles (19th) and a Steeplechase time of 9:37.8 which placed him seventh. In November that year he ran on the second stage of the Edinburgh to Glasgow eight stage relay for the first time and moved his club up from third to second with the second fastest time of the day and the club also finished second. He missed the National in 1963 but was out on the second stage of the relay in November again and this time went one better, picking the team up from second to first with, again the second time of the afternoon. Southern were again second though. 1964, however was his best year and included a victory in the SAAA Steeplechase. He had started the season well with a victory over Ian McCafferty and Fergus Murray in the Nigel Barge Road Race at Maryhill in Glasgow. The Athletics Weekly report read: Murray went ahead at the start, closely followed by Heron. With about one and a half miles to go, Murray who was about 80 yards ahead of Heron, went off course. By the time he was re-directed, Heron and McCafferty were out in front. Murray passed McCafferty but failed to catch Heron – both men breaking Joe McGhee’s course record of 22:40. ” Heron actually took 11 seconds from the time with his clocking of 22:29 with Murray on 22:38 and McCafferty on 22:42. Back in Cambridge, he began by winning the inter-varsity cross-country which was a rare occurrence at that time with Oxford winning almost every year. Then in the Scottish national cross-country championship he was up among the top men again finishing fifth behind Fergus Murray. Jim Alder, Alastair Wood, and Andy Brown to make the team for the international championships. One gratifying aspect of this run was that he led Edinburgh Southern Harriers to their first ever national cross-country championship gold medal. This time the International was held at Leopardstown Racecourse in Ireland and Heron finished 39th. The following season he started with another good run in the Edinburgh to Glasgow on the second stage where he again picked up a place (from fifth to fourth) in the fourth quickest time of the day to see the club win bronze. He was clearly in excellent form over the country and carried this on to the track. On the track, that year, he had three very fast times in Cambridge early on, all of which placed him high on the University’s all-time lists.. On 25th April at the Milton Road track he he ran 14:27.6 for 5000m which is still good enough to see him sixteenth of all time Cambridge students. The top two incidentally here are MBS Tulloh with 14:01,6, and DW Gunstone with 14:09.2. Then only five days later, on 30th April, he ran 3000m in 8:17.4 at the same track which made him fourth fastest University man over the distance behind Mike Turner, MS Henderson and MBS Tulloh again. A month later, on May 22nd, he won BUSF steeplechase championship in 8:58.2 in a meeting record, which was good enough to see him placed fourth on the University’s all time list. This one was run at Iffley Road track. Still in Cambridge he won the Varsity match steeplechase in 9:12.4. Then in June came the SAAA gold medal triumph. 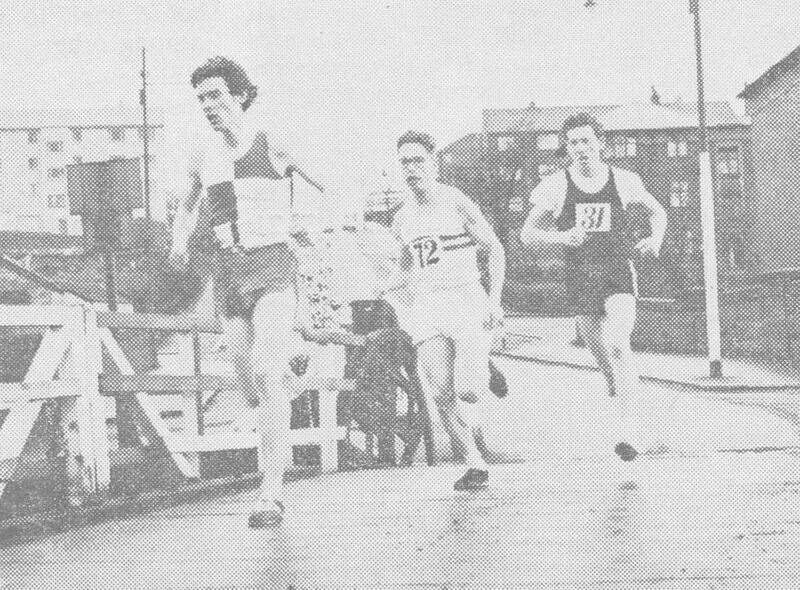 Keddie’s Centenary History of the SAAA reports on this as follows: “Old Fettesian Alasdair Iain Campbell Heron became the first Scot since David Shaw to dip under 9 minutes for the steeplechase when at Oxford on 23rd May 1964 he was timed at 8 min 58.2 sec. Remarkably enough his slowest run of the year was 9 min 14.2 sec in winning the SAAA title that June.” Second in the race was R Henderson, East District champion in 9:30.2: Henderson went on to win the Scotland v All Ireland international steeplechase at Dam Park, Ayr, on 12th August. Heron was unfortnately unable to compete in this international match. The following season, 1965, he started with another good run in the Edinburgh to Glasgow on the second stage where he again picked up a place (from fifth to fourth) in the fourth quickest time of the day to see the club win bronze. In 1965, having been team captain, he was now President of the Cambridge team. The team was of a very high standard with athletes such as Wendell Mottley, the great Jamaican 220/440y runner, as team members. The Achilles team toured USA with traditional matches against Pennsylvania/Cornell and Harvard/Yale with domestic competitions including the classic Sward and Kinnaird Trophy meetings. Other club members around that time were Mike Turner, Tim Briault, Tim Johnston so Alasdair was running in good company. His last run in the Edinburgh to Glasgow relay in 1966 he again ran the second stage and this time, although he ran well enough, he dropped a single place, from fourth to fifth this time. The team, however, was again in the medals when finishing third, one place behind city rivals Edinburgh University in a race won by Shettleston Harriers. Keddie had remarked in the piece quoted above that “Subsequently Alasdair Heron, a brilliant student, completed doctoral divinity studies at New College, Edinburgh, and was appointed to a theological lecturership in the USA, later (1981) becoming Professor of Reformed Theology at Erlangen in Germany.” Heron did indeed go on to have a brilliant career as a theologian and there are many articles and books accessible on the internet and elsewhere to testify to that. Latterly a Professor Emeritus at the University of Erlangen-Nuremberg Alasdair Heron died on 10th May 2014. Finally, although I ran in the 1964 National, I in no way impeded the progress of Alasdair Heron. But on one occasion in the summer of 1962 I did slightly impede him in a three mile race. It was an inter-club meeting between Clydesdale Harriers, Springburn Harriers and Vale of Leven Harriers. I looked along the line at the start of the Three Miles and was confident that I could beat them all – Hughie McErlean would give me a battle but he was beatable. There was one slight figure who had come along with Springburn to the track at Whitecrook but he didn’t look as though he would give anybody any trouble. The gun went and this chap went to the front and came through the lap in 75 seconds. Believing that he didn’t know what he was doing I edged in front and slowed it by about four seconds on the next lap but he came bustling past again just after the half mile and just kept going. And he won so comfortably, hardly breaking sweat, by a distance. Nobody from our club or the Vale knew who he was but we were informed by a Springburn runner that he was the national junior cross-country champion – Heron from ESH. It was one of those moments.